After a long hiatus with no updates, I’ve finally made a few tweaks to our family web site. I’ve also updated my Star Wars web site. 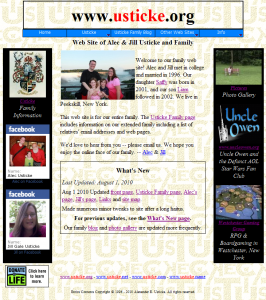 You are currently browsing the Usticke Family Blog blog archives for August, 2010. Entire Contents Copyright © 1996 - 2010 Alexander E. Usticke. All rights reserved.